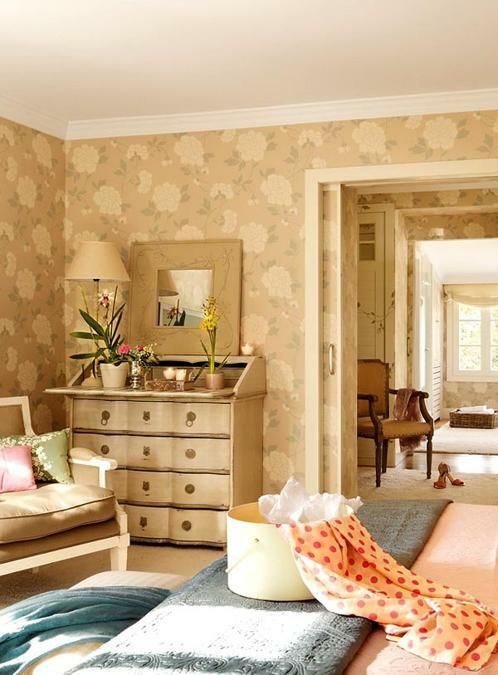 Pink color accents are ideal for romantic home decorating ideas that create very feminine, soft and tender rooms and outdoor living spaces with floral wallpaper patterns and soft fabrics. 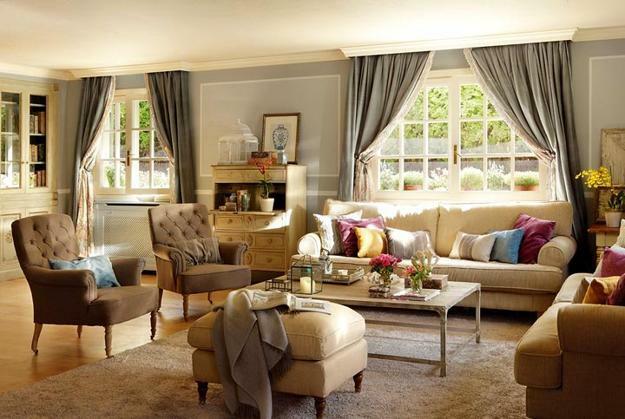 Pastel color schemes with pink color accents feel relaxing and comfortable, balanced and inviting. There are many pink color shades that can amplify romantic effect created with vintage furniture, decor accessories and home fabrics. Finding the perfect pink color tone for room decorating complements interior colors in elegant style and create wonderful atmosphere. This home is located in Spain and shows traditional architectural features, vintage furniture and pleasant interior decorating. 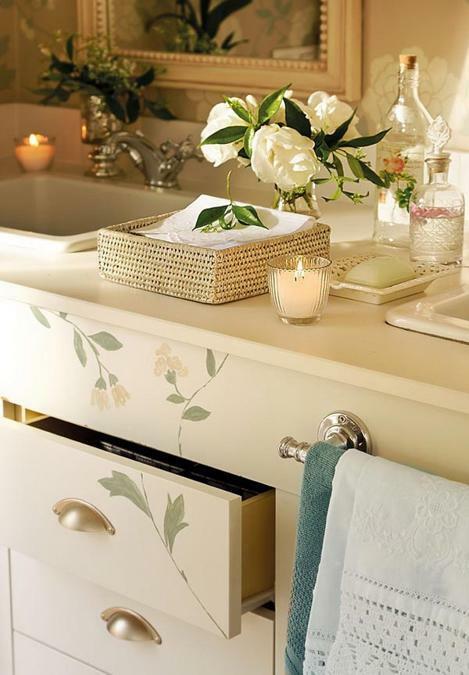 Classic white decorating color shades are soft and creamy, working well with accents in pink color. Classic creamy white and pink color schemes are feminine and soothing, adding peaceful feel to modern interior decorating with vintage furniture and beautiful home fabrics. White decorating ideas, spiced up by pink color are a popular and winning combination that is versatile and suitable for any room. 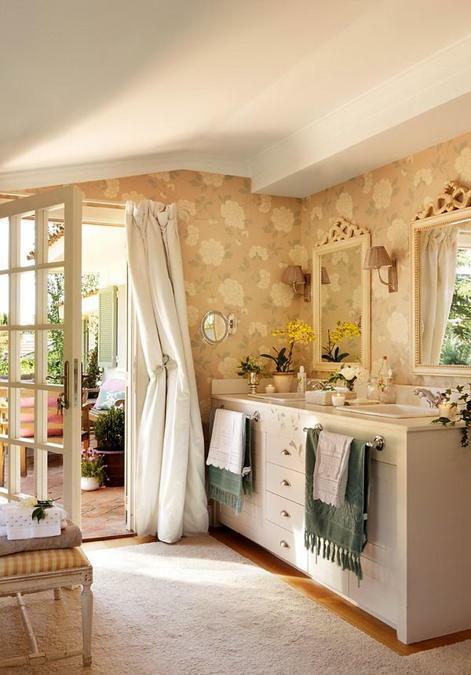 Light beige and light brown color shades of wood are wonderful color design choices that are perfect for pink accessories and floral wallpaper patterns. Soothing contrasts create girly, but modern interior decorating color schemes, balanced with pastel green and blue color tones. Light beige and light brown color shades provide an excellent background for beautiful home decorating with bright pink and purple, adding depth to elegant and pleasant living spaces. 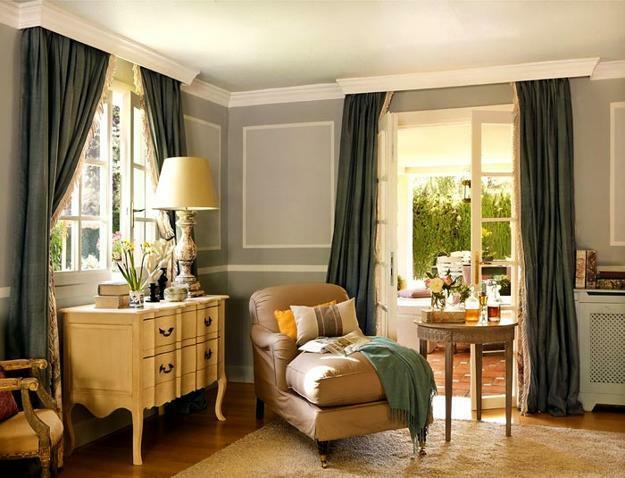 Light brown color shades are ideal for country home decorating and room decorating in vintage style. These comfortable and warm interior colors compliment furnishings in pink color, and look especially gorgeous in girls bedroom designs. Light brown color shades paired with vintage furniture and decor accents in pink color create charming and peaceful home interiors. Light wood finishes, khaki, and light beige color without red undertone are ideal for elegant interior decorating with pink color schemes. Pinkish purple color shades harmoniously coordinate with pink and pastel colors, like green and blue, creating modern interior decorating color schemes inspired by nature. Light neutral colors and soft pastel color shades of green and blue look fantastic in rooms and outdoor living spaces. Pink and purple color shades brighten up dark pastel colors and compliment modern interior decorating with softest shades, blended with white decorating ideas and warm brown colors. Green and blue colors bring masculine energy into interior decorating, balancing pink color and creating beautiful and romantic home interiors. Pastel green and blue colors complement and amplify a feminine look, created with vintage furniture and decor accessories in pink color. Dark pastel green and blue color shades are versatile and gender-neutral, helping design a great background for luxurious vintage furniture pieces and pink-purple accents. 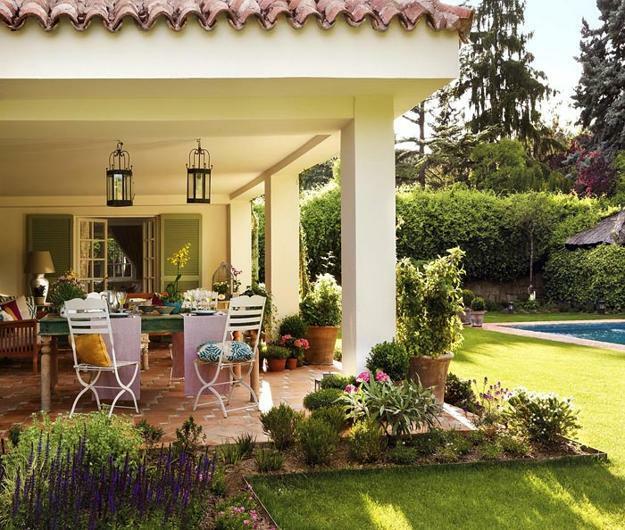 This beautiful home is surrounded by trees that inspired interior decorating color schemes and blend outdoor living spaces with rooms decorated with floral wallpaper patterns and peaceful pastel colors. The courtyard is designed for complete relaxation and pleasure. A nice outdoor seating area with a metal bench in vintage style look picturesque with bright blue and purple pillows and pink flowers, inviting to enjoy natural and beautiful surroundings. Green lawn and flowers create a wonderful fresh aroma. Green shrubs and beautiful flowers in large flowerpots decorate the terrace in elegant style. Green and blue colors of lush vegetation and the outdoor swimming pool create fabulous contrasts of the light house walls and traditional roof in Spanish style. 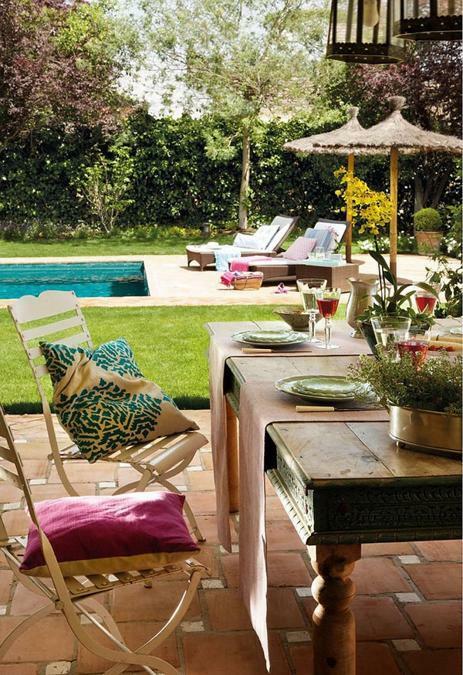 The terrace with dining furniture and lanterns emphasize charming atmosphere of vintage style. ome – spacious and sunny. Large windows let in sunlight and a large amount of air in the room. Calm tones do not load the nervous system. According to psychologists, they give strength and self-confidence, maintain a peaceful atmosphere in the house. Vintage furniture and decor accessories, combined with soft home fabrics and floral wallpaper patterns are beautiful home decorating ideas that give a touch of antiquity and luxury to modern interiors and outdoor rooms. 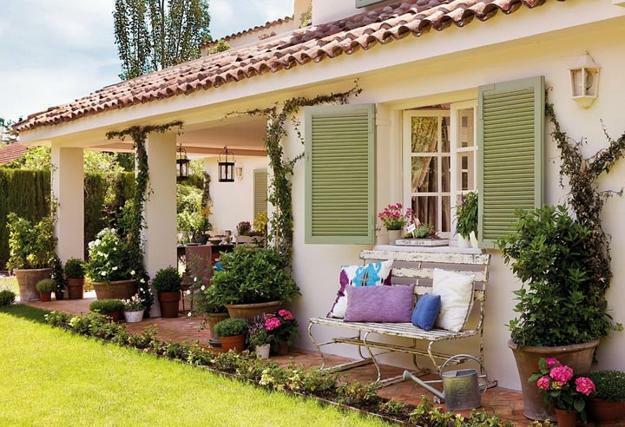 Vintage style and pink color schemes allow to create exclusive, chic and classy interior decorating and add character and elegance to outdoor living spaces. Vintage decor accessories, like wood framed pictures, wall mirrors in large carved wood frames, decorative pillows made with soft and silky fabrics, antique glass bottles, original vases, white bird cages and ceramic flowerpots, create a unique and beautiful home interiors. Soft and romantic, modern home decorating ideas and quiet color schemes create pleasant and comfortable atmosphere reminding of the family traditions and values. This home decorating uses natural materials and brings lots of natural light into rooms, creating pleasant and comfortable, warm and modern home interiors that feel in harmony with the nature. An abundance of sunlight feels cheerful, optimistic and uplifting, adding energy to beautiful interior decorating in vintage style.